Leading Manufacturer of glamorous simple elegant designer sarees, multi color designer sarees, embroidered designer ethnic sarees, fashion net designer sarees, net flora design bollywood designer sarees and indian classic partywear sarees from Chennai. We offer array of Glamorous Designer Saree which is available in several vibrant colour, design as well as in line of recent trends. All sarees are appropriate for brides and family members of the bride. This saree add the sense of elegant and glamorous. Beautified with beautiful work all synchronized well with the pattern and design of the attire. We offer a wide range of beautiful designer sarees, which come in vibrant colours, varied sizes, designs and patterns.These Designer Sarees are available in various unique prints, they are also soft and comfortable to wear and can easily lure anyone. In addition to this, clients can avail these products from us in various alluring designs, colors, sizes and styles as per the individual preferences of clients. 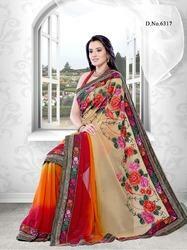 We are engaged in offering a wide collection of Printed Designer Sarees. This high quality fancy designer sarees are available with us is perfectly suitable to be worn on special functions and occasions These Designer Sarees are available in various unique prints, they are also soft and comfortable to wear and can easily lure anyone. In addition to this, clients can avail these products from us in various alluring designs, colors, sizes and styles as per the individual preferences of clients. This purple Net jeckard saree is worked upon by dedicated team of best designers to give you unique and rich look. Admirable body is enriched with gleaming jari, sequins, resham embroidered floral creeper motifs and all over butties are giving fashionable flash to it. In addition to this, clients can avail these products from us in various alluring designs, colors, sizes and styles as per the individual preferences of clients. We are engaged in offering a beautiful collection of designer sarees. These Designer Sarees are available in various unique prints, they are also soft and comfortable to wear and can easily lure anyone. In addition to this, clients can avail these products from us in various alluring designs, colors, sizes and styles as per the individual preferences of clients. Fabulous red color georgette saree is beautified with shiny sequins, blooming cutdana, beads, diamonds, glossy stones, jari, jardozy, resham embroidery, foils, kasab and fancy work floral motifs. In addition to this, clients can avail these products from us in various alluring designs, colors, sizes and styles as per the individual preferences of clients. Our discerning clients are being offered an impressive gamut of Dupion Silk Attires Designer Sarees that includes New Design Ethnic Designer Sarees. These are painstakingly crafted by our teams of adroit designers and skilled technicians by using the finest grades of fabrics. These are having intricate designs and elaborate patterns that are visually pleasing. We have state of the art manufacturing facilities to manufacture these Sarees by using high end technologies. Our quality standards are at par with well defined norms of the domain. Our valued clients are offered our flawless range of Sarees at very reasonable rates. Leveraging on our rich industry knowledge and profound experience of manufacturing, supplying, and exporting an impressive collection of Dupion Silk Attires Designer Sarees we are offering our discerning customers a premium range of Art Silk Designer Sarees that are made by using traditional designs and modern technologies. We use the finest grades of fabric and maintain very rigorous standards of quality that are in adherence with set norms of the industry. We are supported by teams of adroit designers and skilled technicians to offer an amazing array of these sarees with arresting designs and vibrant colors.